Looking for a new place to eat at this weekend? Head down to the south and pop by the Designer Blooms Café located at Molito, Alabang. The Café is quietly located at the back area of the complex, hidden from Alabang’s busy Madrigal road. The Designer Blooms Café’s interiors bring the outdoors in with its fresh flowers and quirky mismatched patio furniture—reminds me of an image of my ideal weekend brunch. A window that goes up the ceiling allows enough natural light to penetrate the Café, giving life to the whole place. Not only is the Designer Blooms Café a feast for the eyes, but also for your taste buds. I visited the Café together with my south loves, Angel and Verge, and we got to try a couple of their offers. To kick things off, we were served our preferred drink. I had the Café Macchiato. I can’t say it’s the best I’ve had, though. I would have expected more from a place that has “Café” attached to its name. However, this was later on greatly made up for when the food came to our table. The Hearty Mushroom Soup (P189) was something I liked. If you’re the type who enjoys a flavorful and thick soup, I would recommend trying out the Hearty Mushroom Soup. Angel, however, found it too salty (or pepper-y?) for her liking. Next, we were served with flat bread, partnered with diced tomatoes, Bruschetta and Grilled Mushroom Salpicao (P235), and Tinapa Mousse with Toasted Flat Bread (235). Personally, I was surprised by the last one. I did taste tinapa on there, but nothing overly fishy or malansa, if that makes any sense. We also had the Spinach-Artichoke Grilled Chicken Panini (270) and DBC Jalapeño Burger (P420). The burger wasn’t spicy at all, if in case you were wondering. However, I did prefer the Spinach-Artichoke Grilled Chicken Panini more because I am more of a chicken-person. Both were just as filling, though. Also, we got to try the Truffle Mac and Cheese (P275), which definitely owned up to its name, as you can see on the photo. 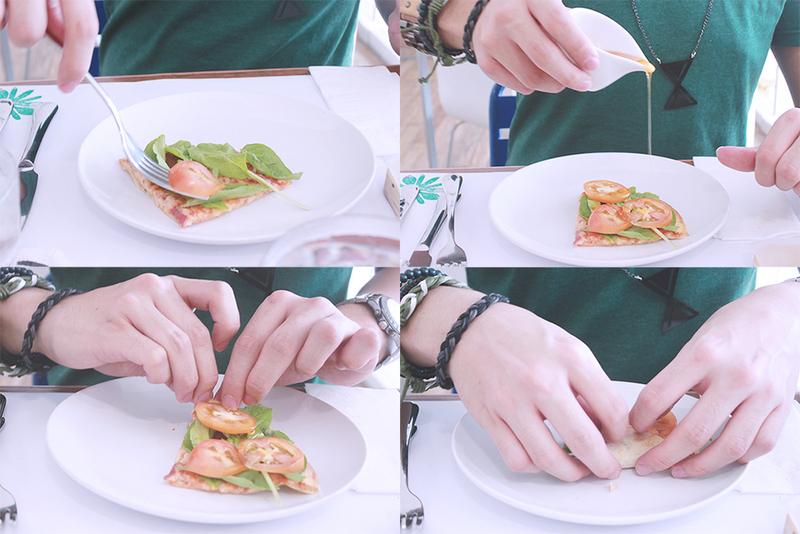 Lastly, the Pepperoni Panizza (P225) was not only delicious, but also fun to make. For the price, you get a 6-slice pepperoni pizza that you get to customize by adding on fresh tomatoes, basil, rocket arugula, alfalfa sprouts, and chili oil as you wish. The food was filling and flavorful, but you do have to know that it is on the pricey side. But if you’re up for a “weekend garden-feel brunch” experience regardless of what day it is, then check out Designer Blooms Café. Aww! Are you from the North? :( There are a ton of places I wanna check out too around there. Yeah I am. But I don't go out a lot here too :( Nobody willing to be kidnapped to tag along with me haha.